There's an ineffable quality to Monomyth's studio recordings that can make it difficult to figure out exactly what's going on. Live, however, their off-kilter space-rock comes into focus: it's the interplay between guitarists Josh Salter and Seamus Dalton that forms the basis of their sound, with Salter's leads anchored by Dalton's rhythm playing. 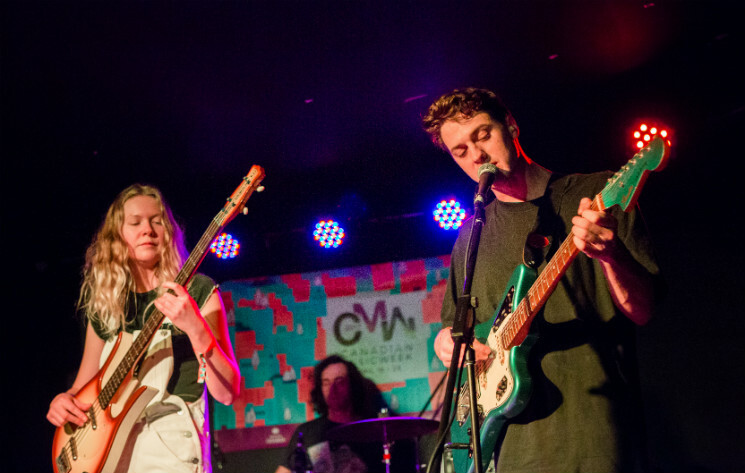 The Halifax-via-Montreal quartet were in fine form for their short set at CMW last night (April 19) as they worked through songs from their two full-lengths. There was a palpable sense of disappointment from the band at the rather tiny turnout for the show — "I think I know half the people here," joked Salter at one point. Dalton, standing with his legs crossed for much of their time on stage, looked disinterested in the entire thing, watching his bandmates as they joked with one another. The result was a set that felt more like band practice than performance. Yet, that disassociated aesthetic gave the show a loose vibe that worked well with Monomyth's music, and the crowd that was present was more than appreciative of the effort.